Retinoids are a class of compound vitamins extracted from vitamin A, that is frequently used in skin care. Listed in the order of potency: retinoic acid, retinaldehyde, retinol, and retinyl palmitate. 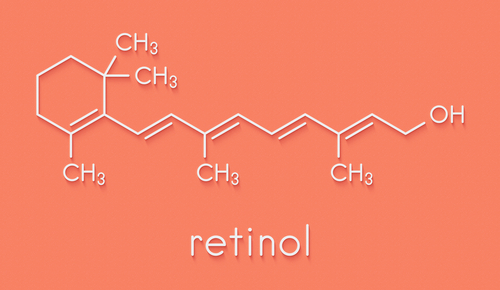 The ingredient retinoic acid is the active form of the chemical that can be easily used on skin, however almost always requires a prescription like tretinoin. “They act as an exfoliant and improve skin cell turnover,” says Dr Mahto. “So, they are particularly effective in people with sun damaged skin, or those suffering from acne. “They also help improve the appearance of fine lines, wrinkles, age spots, and skin pigmentation by increasing the production of collagen and stimulating the blood vessels in the skin,” she adds. Opt for an over the counter product that has at least 0.1 percent retinol and read the entire ingredient list or ask at the counter what the product contains. The amount of retinol may be increased to 0.3 percent or 0.5 percent as your skin builds up the tolerate to it. Common side effects will include stinging, peeling, burning, and irritation upon initial contact with skin. As you begin to build up the tolerance by steadily using it a few times a week, you will get to gauge and see what you can manage – if the product makes your skin sore, chose to give it a rest. If your skin can endure retinol, you can choose to up the amount of times you’re using it per week. For sensitive skin type, or those that suffer from inflammatory skin conditions such as rosacea, eczema, or psoriasis, consult with a dermatologist before using as the products can possibly cause further skin problems.